Last year’s Temple Owls failed to make the playoffs after finishing with a 15-25 overall record, including 6-8 in the Atlantic Ten Conference. After missing the Atlantic Ten Conference Tournament by one game last year, the softball team and second-year coach Joe DiPietro have one goal in mind this season. Temple was picked to finish in sixth place after ending the 2009 season with a 15-25 overall record, including 6-8 in the A-10. During the offseason, the Owls have been continuously training in an effort to ensure the upcoming season ends in a more successful outcome. The Owls recorded a winning record (5-3) in the fall season and claimed the Pool A Championship in the final tournament at the Pride College Showcase in Newark, N.J.
Metzler started all 40 games last season and finished with a .996 fielding percentage. She threw out 12 runners attempting to steal bases. “We’ve been practicing a lot, putting a lot of time in the weight room,” she said. The team returns two experienced pitchers in junior Amanda Branco and sophomore Lauren Spoo. Junior Kristen Marris, a first-year transfer from Midland College, Texas, is projected to be a big part of the team’s rotation and has pitching speed in the upper 60s, DiPietro said. Marris was a 2009 National Fastpitch Coaches Association (NFCA) National Junior College Athletic Association (NJCAA) Division I All-American Second Team and All-West Region First Team selection. 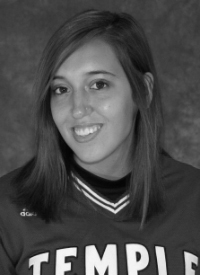 Another highly regarded new pitcher is freshman Crystal Nyman. DiPietro said she can also throw in the low 60s. Additional newcomers include freshman Ali Robinson, who is expected to start in center field; freshman Kayla Cook, who will back up the catcher and third base positions; and sophomore outfielder and shortstop Christina Sykora, who batted .179 with four doubles and two home runs last year. The trio of captains will lead a team of young talent expected to make a significant impact this season for the Cherry and White. “We did lose a decent amount of starters, so it was big for the new people to immediately step up and take the roles that they know they’re going to play,” Lerner added. The Owls’ first game is against East Tennessee State at the Georgia State Panther Invitational in Atlanta. Temple’s schedule consists of two road trips to Florida tournaments and 14 games, some of which are doubleheaders, at Ambler Field. After missing A-10 tournament last season, Owls will face Duquesne.